What if all our actions were peace? What if we never reacted in fear? and acted with confidence here? What if we trusted instead of protected? 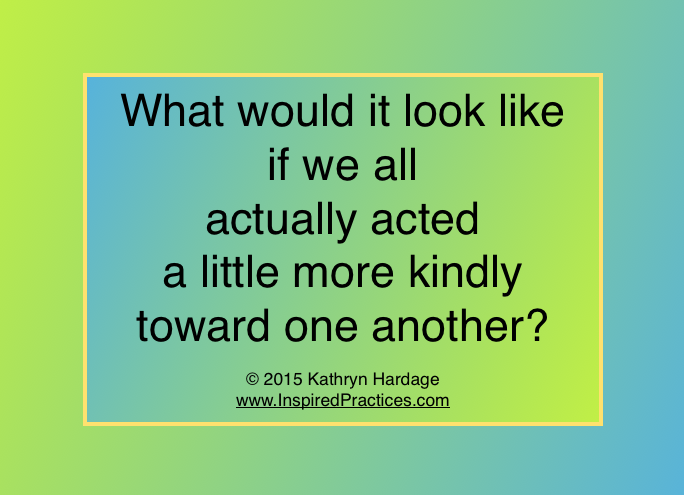 What if we reached out instead of turned inward? had circumstances that could not be overcome? What if we took little steps to include them? What if we took little steps to meet their needs? What if we took steps to enrich their lives? We would find our lives become that much richer. What are the actions which will bless all of us? What are the actions which will enrich all of us? What are the actions which will take care of all of us? What actions show where we live in our hearts? What will it look like when heart-living is our way? What will it look like when all are important? What will it feel like when all know they are included? What will it feel like for all to be safe?